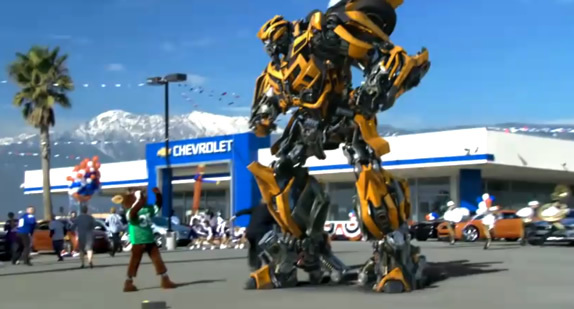 Bumblebee in a Chevy ad to be aired during the Super Bowl. Chevrolet will air five 30-second commercials during Super Bowl XLV Sunday on FOX, representing only part of a coordinated TV presence that continues into a special post-game episode of “Glee,” the FOX hit musical comedy. The Camaro, Cruze Eco, Silverado HD and Volt will be featured in a combination of in-game and post-game ads, plus Chevy is presenting a Camaro Convertible to the Most Valuable Player from Super Bowl XLV between the Pittsburgh Steelers and Green Bay Packers. This is still not the new trailer of Transformers 3 Dark of the Moon scheduled for the Super Bowl XLV 2011.